Last Friday, on the younger kids’ day off from school, we visited Longwood Gardens in Kennett Square to catch a glimpse of the seasonal color change. Around Philadelphia, only the dogwoods and maple trees show hints of the coming change. In true Longwood fashion, the gardens reflected the color palette of autumn, giving us a taste of what is to come. 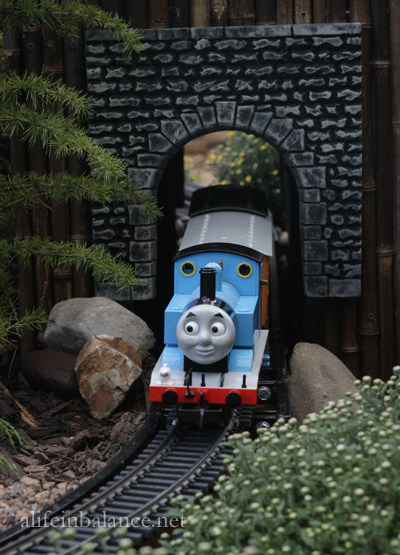 Our first stop was a visit with Thomas the Tank engine at Longwood Garden’s Garden Railway. 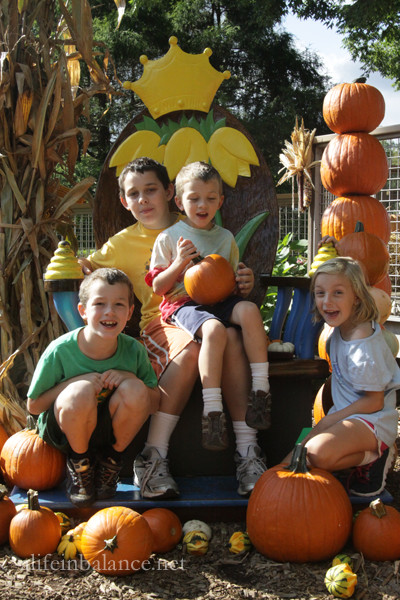 Located near the Chimes Tower, the Garden Railway is an easy walk from the main gate. You’ll find 2 displays, one with about 4 trains running, and the other one just for Thomas. 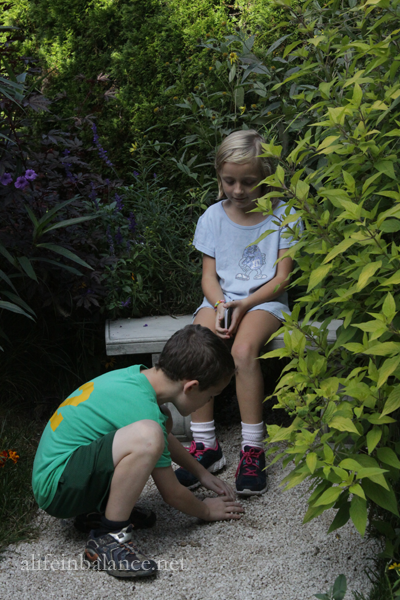 On this trip, we found the student gardens located near the Conservatory. 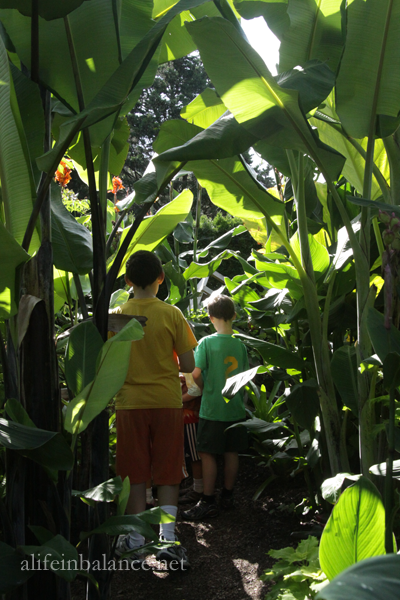 My kids loved coming from the vegetable garden nearby with its fall planting of lettuces and kale to this jungle of banana plants and new surprises around every corner. 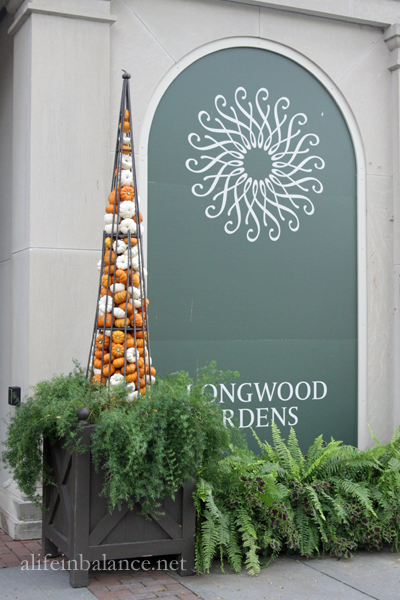 Longwood Gardens provides a variety of educational programs for the public. Kids can learn via school trips or scouting programs. Teens interested in horticulture learn through the 9-12 cooperative program. Adults interested in horticulture as a hobby can take practical courses while adults interested in pursuing horticulture as a career can apply for the prestigious Professional Gardener program. Of course, my boys always find the small stones to build into small piles! While Longwood Gardens’ displays are for eyes only, there are several places for children to enjoy the gardens through hands-on experiences like the Children’s Garden and the Tree Houses. The wide walkways are perfect for strollers, walkers, and the occasional cartwheel. 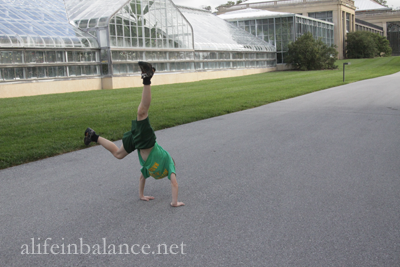 Behind my son is the Conservatory, home to the Children’s Garden and the Longwood Organ. 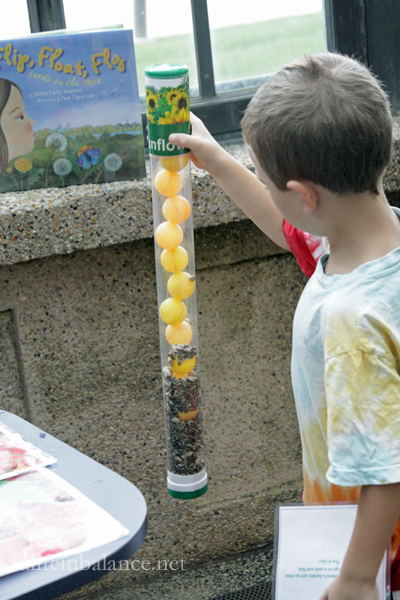 At an education station just inside the Children’s Garden, my youngest son was fascinated by the different rain sticks. Each type of seed in the rain sticks makes its own sound. We also made small bookmarks with dried leaves and flowers, just a piece of cardstock, dried leaf or flower, and a covering of clear contact paper. 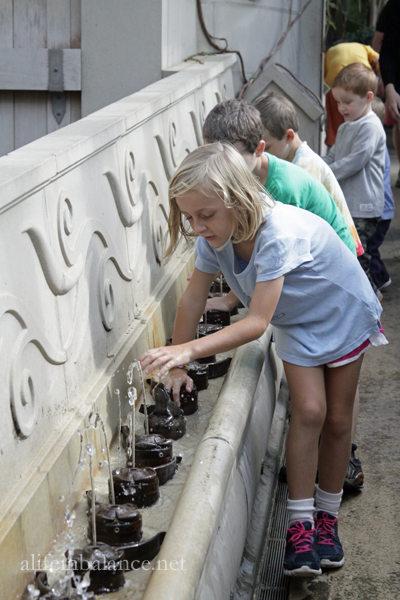 There are so many ways to play with water in the Children’s Garden! The kids run up and down this wall trying to stop the small fountains of water. Just above this area, a small squirt of water jumps from spot to spot up and down the wall, while children paint the walls with water in the grotto. Despite my post yesterday about not having much success with family group photos for Christmas cards, I succeeded with a great shot of the kids at Longwood. Unfortunately, the teen is not in this photo, or I could use it for the Christmas card. As always, I take all my photos while out with the kids with a Canon Digital camera. I travel light with a used Canon 50D and a 28 to 75 mm Tamron lens . Since I still haven’t gotten around to getting a camera bag, I use a cute camera coat to protect the camera in my car. If you decide to upgrade from the Canon Rebel to the 50D, give yourself time to get used to the exposure compensation. I love Longwood this time of year! Are they doing the pumpkin/hay stack patch this year? I have never been to the children’s garden.. excited to check that out! Yes, I think it opened last Saturday. ok. THIS is the year I am taking W to Longwood Garden. You have convinced me. These photos are great! Oooh! I didn’t know the trains were up. We must take the boys. Though I may need to use the comp membership scooter to get around these days! Looks like so much fun! We have to take a visit there, one of these days, I hear such good things about it. I love longwood! We have a pass but haven’t gone in awhile. It is a perfect place for my almost 2 year old to run and explore! I’ve still never been to Longwood Gardens. One of these days I’ll get there. It looks great! I LOVE longwood. It’s a special place that is different every time we visit and we could never get sick of going to.